Volleyball Kicks Off CRDLS Athletics! Tuesday, September 18, 2018 and Friday, September 21, 2018 now mark two important dates in Cristo Rey De La Salle history. 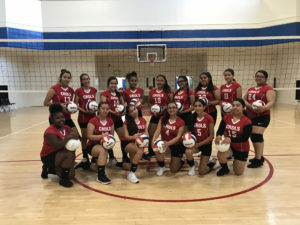 Tuesday, September 18th was the first ever CRDLS athletic competition against CA Crosspoint followed by CRDLS’ first home game also against CA Crosspoint on Friday, September 21st. Friday’s game brought out huge support from faculty, families, and fellow student associates. Although our Lady Mustangs were unable to win against CA Crosspoint in either matchup, they continue to show significant improvement. Coach Orozco has also brought in other St. Elizabeth Alumni to assist with practices and games so that our Lady Mustangs can better learn and understand volleyball. Thank you to all who have come out to support our Lady Mustangs! We would also like to thank The Olive Street Agency for providing our new uniforms. We are grateful to the Olive Street Agency as they will be providing new uniforms for all of our athletic teams this year.